It’s Fashion Week in New York and my friend is at the shows, posting her whereabouts on Instagram, etc. It’s a not so balmy 4 degrees fahrenheit outside, and long legged gals, with weather having no effect on their dressing decisions, show them off. I don’t think them crazy; actually quite the opposite, I’m proud of them. Li and friends at NYFW – Photo credit: Ellen Xiong on Instagram. Years ago when I first started in the industry of fashion, my “not-so-old” mentor, a beautiful woman, used to tell me that there was no temperature when it came to fashion. She had no problem wearing wools in the dead of summer or skin bearing items in the middle of a cold winter. Whatever the case, she always looked polished; and I eventually found myself doing the same. A peek at the Galleria from a window at the Duomo. in which I spent much of my time during that period (which happened twice in the calendar year). Milan’s Duomo and the Galleria. The quotidian details would include, hours on end at the buying offices, either selling or buying, depending on my title I held at the time. I have memories of keeping my scarf on in the winter because those 17th-century buildings never really got warm in the winter, and loosening my tie often in the summers, as those Italians feared air conditioning like Superman does kryptonite. 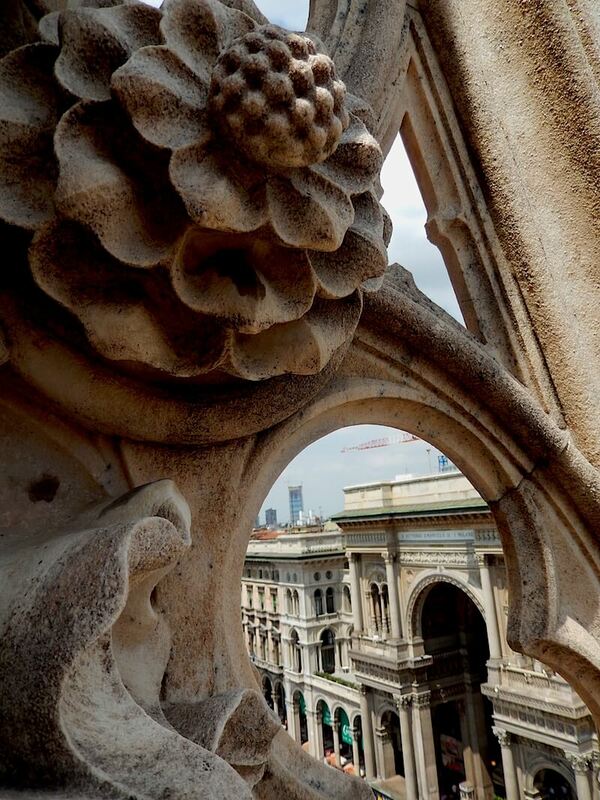 A view from the Top of the Duomo in Milan. Fashion Week and extend my stay. I have a fondness for this Northern Italian Town. It will always be a second city, next to the likes of Rome, Venice and Florence when it comes to being a destination; but for me, Milan was the best. It was more patrician and less about what sights to see next. 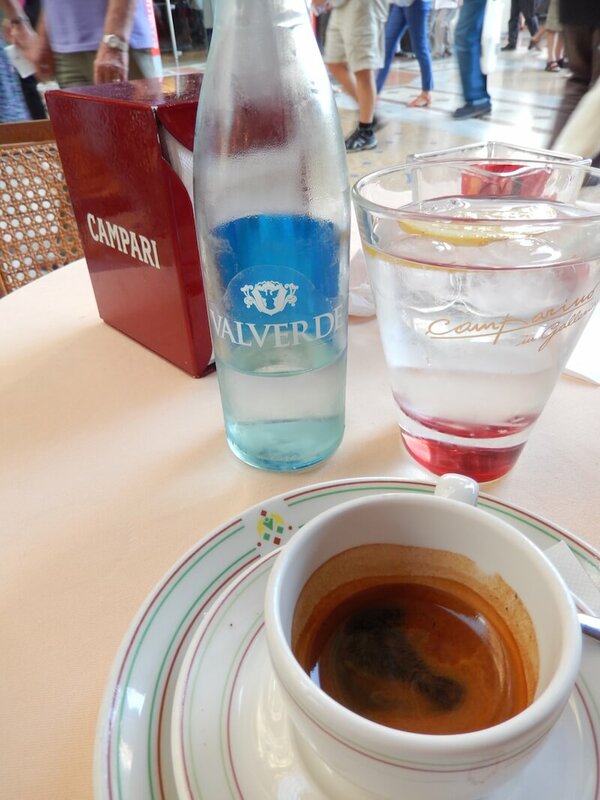 , at a cafe in the Galleria Vittorio Emanuele II, that I had my first cappuccino with Brenda. I had my very first business lunch at Paper Moon on Via Bagutta. My first Negroni at the bar of the Four Seasons on Via Gesu. I spent a night at a place called Antica Locanda Solferino where I had my first vitello milanese. , I learned in Milan. Original Prada Boutique at the Galleria. Our daughter Bailey, did not fall too far from the tree as she too has a bit of the fashion bug. She also has a passion for traveling, even at an early age. Most of all, she really enjoys eating good food. Brenda and I couldn’t have asked for a better third partner in our new life and business of traveling the world, experiencing it’s people and it’s cuisines. Actually, the impetus for our new lives, was the portion of our summer vacation in which Brenda and Bailey, without me, traveled all over Italy together. They started in Milan. With me not in tow, Brenda did her best to replicate some of the events that we cherished as a couple, with our child. 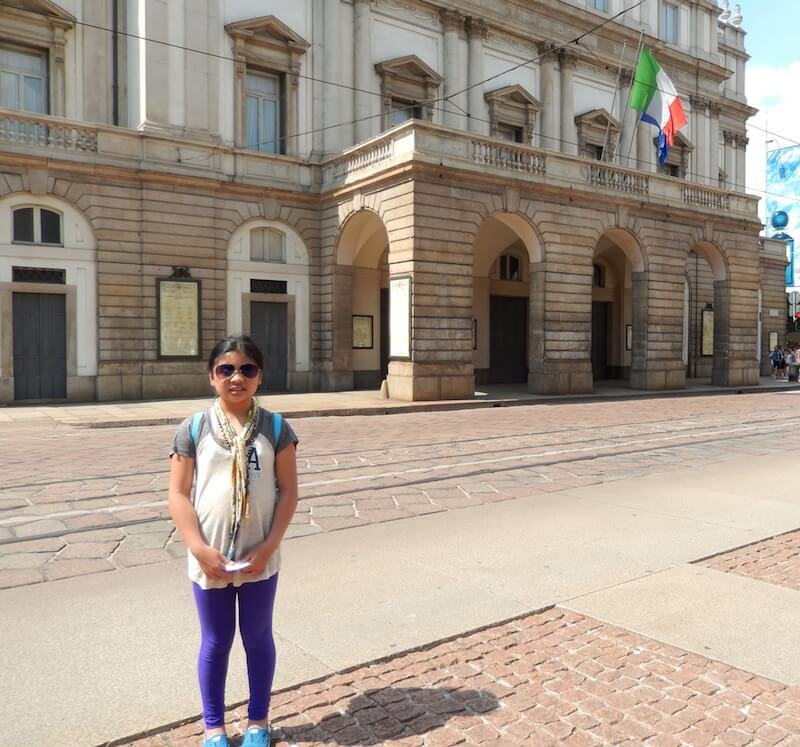 They passed through La Scala, and with my daughter being a violinist, Brenda thought it important that she saw where the likes of Verdi, Rossini, Puccini had their operas performed. , Etro, Cavalli, etc.. To our credit or misfortune, Bailey knew as many designer names as she did composers. This is where I bought my first Trussardi weekend bag, way back in 2000.
, and some of the things Brenda and I did would not have been fun for a 10-year-old, so things had to be modified a bit. For example, Brenda didn’t think that a drink at the Four Seasons bar was a good idea. Princi Bakery – a great place to have lunch of snack after a visit to the Duomo and the Galleria. So they of course found their own little treasures. One of those little treasures was a place named Princi; a panetteria, which have savory and sweet bread offerings such as pizzette with nutella or a roll with salami. It made for a nice respite after a morning of walking. A trip inside the Galleria Vittorio Emanuele II was on their itinerary. While there, they made a stop at it’s famous tile floor depicting the Torino Bull, where supposedly, putting your heel on it’s testicles and spinning brought one good luck. So Bailey did her best twirl. Bailey having a turn at luck. 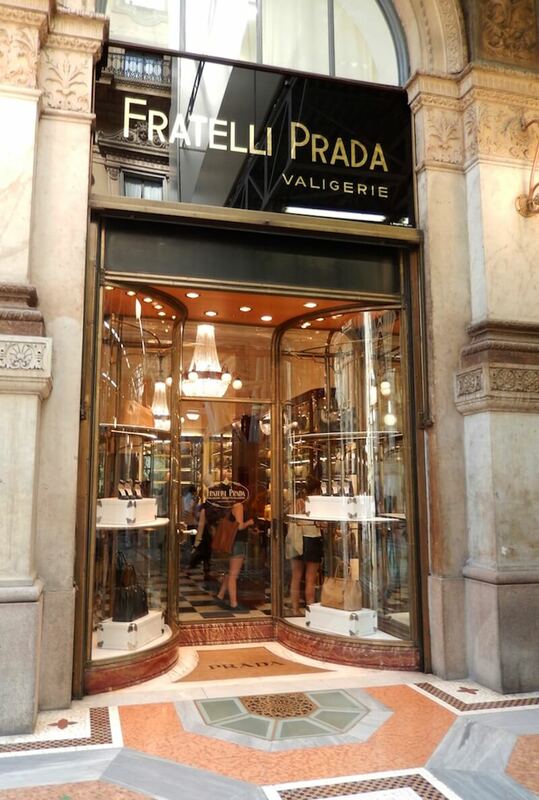 Also mandatory, was a stop to look at the oldest PRADA boutique in the world. This specific boutique has an old world opulence about it, that is unmatched by any other boutique in Milan. The Galleria is an impressive work of architecture and is the oldest “mall” in the world. It’s positioned between two of Milan’s most famous landmarks, the aforementioned La Scala on one end and the Duomo on the other. Before exiting the mall, Brenda stopped in at our cafe and reminisced with an espresso as Bailey enjoyed a panna gelato. She was mindful of the time when she ordered her cafe as she respects the unsaid protocol of not having a cappuccino after a certain time (espresso only in the morning). While sitting, the girls couldn’t help but be overcome by the beautiful and imposing Duomo before them. 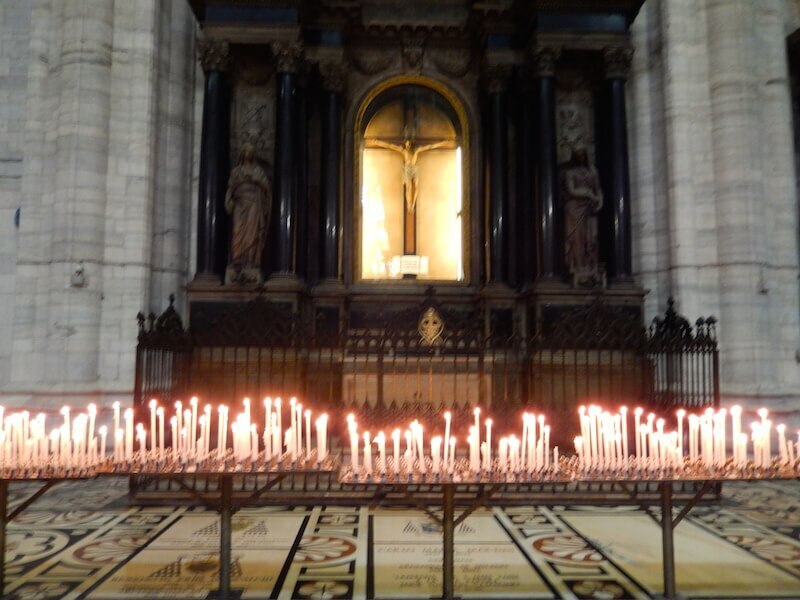 I spent many a morning at the Duomo in Milan, lighting a candle, mostly for my own success. I was young then… One of my fondest memories was a cold, yet sunny day in Milan, when I took Brenda up to the roof of the Duomo to take photos of the beautiful spires and the city below it. Those photos are stashed in some archive file somewhere, so it was time for Brenda to take new ones; this time of she and her daughter. It was just after having taken these pictures that they called me back in the States to tell me of the day they have been having. I don’t think I have ever missed them the way I did that day, nor missed a town so much. I have my memories, and they were making theirs, and for that I was happy. If there is a dish that bests transports Brenda and me to Milan, it would be Vitello Milanese (or cotoletta). But for the mother-daughter combination, it would have to be Gnocco Frito with a selection of salumi. Gnocco, is a light fried dough, usually made of semolina. It’s usually presented in triangular shapes, and it’s distinguishing characteristic is the hollow middle. A selection of cold cuts with fried dough called Gnocco. This bread is traditionally served with a selection of Italian aged meats and cheeses. It was their staple starter to every meal and their “go to” order when they were in a bit of a rush. Imagine having for the first time, those warm little fried delights accompanied by fatty cold cuts, and a glass of wine. A taste memory like that will forever be linked to where you had it first, no matter it’s origin. The restaurant were we had our first Gnocco – Hysteria Borromei. Last night, I turned up the heat in the house. While getting ready for bed, my daughter (also having viewed the same posts my friend made on Instagram about fashion week) asked me if she could go and see the shows one day. I said yes, and maybe I’d even try to call on my old contacts and see a show in Milan, but only if she promised me that she would dress appropriately. 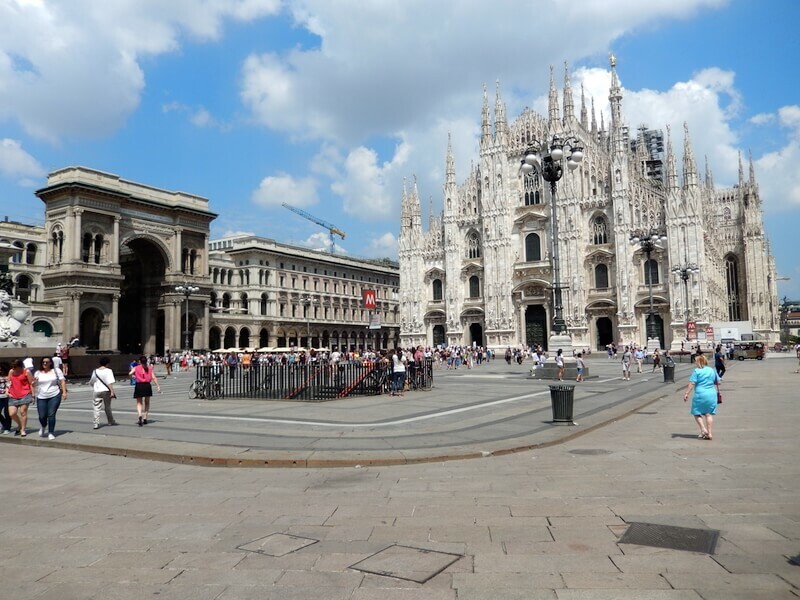 There are so many great places to see in Milan, I think you and your family will truly enjoy this great city as much as we have. Did you enjoy this Dish? Then, please share it with your friends, we’d be so grateful. Remember: Let’s travel the world, One Dish at a time. We took SAS from NYC to Milan’s Malpensa Airport with a stopover at Copenhagen. Airport shuttle bus into Milan’s town center. Hotel Gran Duka di York: This was a recommendation by Rick Steves. Bailey and I were very comfortable there in July 2014. It was the best hotel for us. It was walking distance to the Duomo, Galleria and many other sites. We were also taken such good care of by the concierge. The rate included breakfast for us, which was about $225 a night. Antica Locando Solferino – Andrew and I stayed here often during our stint at the House of Valentino. A bit older but very comfortable and cozy with a restaurant around the corner. Not as convenient as the Hotel above but has a great neighborhood as well called Brera. Hotel Principe di Savoia – During our time in Valentino, Andrew stayed here numerous times during market. It’s quite luxurious and convenient in location. I had a chance to stay there once as well and It was surely decadent. Hostaria Borromei – this is where we had Cotolleta and Gnocco Frito with salami. We also had a good Ragu. Princi Bakery – Great place to stop for quick lunch or snack. Some links are affiliates but as always, price remains the same for you. I loved my trip to Milan. The architecture is amazing and the food fantastic. I actually prefer it over Rome! I like Milan but Rome is my favorite city in Italy. I love the history there. I have absolutely no interest in fashion but I would definitely love to visit Milan! I loved reading the memories and comparison of old and new trips! I love sharing my favorite places with family and friends! Milan is now on my list of places to go! lovely. i have always been interested in fashion week (and i fulfilled a lifelong dream a year and a half ago to be in paris during that time). milan is one of my favorite cities, and i am fortunate to have family that live nearby – makes it even more special. Really cool photos. I don’t know anything about fashion but since I missed Milan last time I was in Italy I definitely want to head back and check it out soon! Gnocco looks delicious! Milan looks beautiful, and being there during fashion week would be so much fun! You may or may not realize it, but the impact of you sharing what was a very important part of your career in the place in which your milestones happened with your daughter will be lifelong. I had to chuckle about wearing seasonally-inappropriate things. Long ago in the 70’s when I was in the business we routinely wore open-toe high heels in below freezing temperatures, tottering through the snowbanks. I ruined many a pair of Charles Jourdans in this way. Thanks for conjuring up a long-lost memory! It seems worth the trip to stop at that bread shop!! Your pictures are amazing – So glad you got to experience it together! Milan+Fashion Week + Food = My #SomedayList! I love this story. It was so many details that have me totally dreaming of that trip! 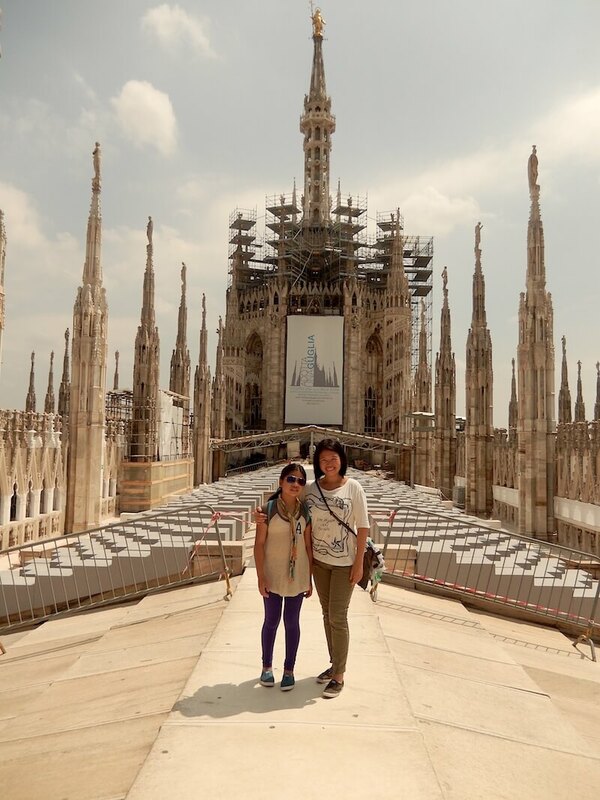 I love how you were able to share your love of Milan with your daughter and experience it all over again with her. Fantastic read! Cheers! Doesn’t it look scrumptious? It was a real indulgence that my daughter and I absolutely loved. Thank you for joining our adventures Lily! I’m totally drooling too! There could be nothing better than a beautiful board of charcuterie with a glass of wine in beautiful Milan!